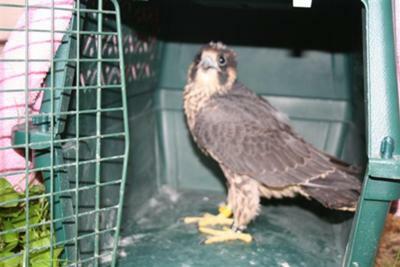 This juvenile male Falcon was born under the Ambassador Bridge in Windsor Ontario. He and his sister floated to the ground several weeks ago. The parents will not feed the young birds on the ground, only in trees or elevated buildings. This creature was found near a major highway, so to prevent being hit by a car, or eaten by a predator, the falcon group rescues them when they appear weak. At night, they elevate them into trees or on flat roof for mom and dad to find the next day and feed. Another great submission to our website! Thank you, this is interesting and your picture is great! I hope this Falcon and his sibling do well and survive.